I arrived in Berlin today but this was not without any luck. The airplane from Seatac to Heathrow (London) was 35 minutes late, there was heavy congestion at Heathrow and so we were airborne for another 20 minutes. Thank goodness the airplane made up for the lost time in the initial delay in the departure but the congestion just added another lovely layer of stress. I was rushed through all of the security lines and was, in fact, resigned to not making the next flight. However, the next airplane was also delayed in its descent due to the congestion and add another mechanical problem, the engineers had to fix the airplane after we all boarded. A resounding: woooo!!! rang through my head. I’m being sarcastic. In any case, I got through Customs(the man asked me no questions) and found my suitcase fairly quickly. I was a bit confused in how to hail a taxi until I realized there was a designated area. The taxi ride was very long due to the amount of traffic. Great time for reflection, you say. I was incredibly exhausted and only wanted to know if I could even get into my building, I reply. We finally make it to my building but there I was, standing in the drizzling rain with my two carry-on pieces and heavy suitcase. I sighed and reviewed this exact scenario I had envisioned a week before. What did you do in this make-believe sequence? I take my life into my own hands, I mentally screamed at myself. Stop being so shy and unsure. So, I rang a random person’s bell to see who would answer. I quickly explained that I was new and lived on the 4th floor. The woman said something along the lines of “It’s the next three” but I was so confused and kept asking her what next three? After 30 seconds of misunderstanding between the two of us, she gave up and just buzzed me in. There were two doors in that entryway. Which one??? The one on the left seemed safe enough although I still hesitated and walked around the entryway for a few minutes. I went with the door to the left b/c it was 1) open and 2) the first door was labeled as a law office that showed up on the buzzer list. Aha, this might be it. I decided to risk leaving my suitcase at the bottom of the stairwell because there was no way I could bring that thing up with my two carry-ons after the 14-hour trip. I tried counting to make sure I got to the 4th floor but I miscounted (which I figured I would do) and rang a random door on the third floor. It didn’t seem right since there was a label that noted a Dr. lived there (Germans love their titles…he/she may not be a medical Dr.), although I heard people in the apartment cooking. They decided not to open the door. I decided that this was probably the wrong floor and walked up one more floor while praying that this was the correct building. I had no one’s number so how was I going to contact someone if I were really lost? As you might have guessed, I got LUCKY because a 20-year-old student answers and asks me if I’m the new person in English. The Landlady, C, confirmed it was me after asking me if I was Jill and I had said yes. I was so incredibly relieved. I also realized how stupid I was for going about this moving-in-thing in the worst way possible. I’m not even going to ponder about what if’s because in reality, it was not that stupid. I knew the building number. I knew the floor. I just didn’t have a phone number. I’m still settling in and fighting the jet lag so I can go to bed around 10:30 PM. But the verdict is: this apartment is amazing. My suitemate is very friendly, kind (he lugged my suitcase up the flights of stairs) and my Landlady as well. I call her by her first name since that’s what P, the suitemate, calls her but I definitely still use formal German with her. I’ll be meeting my teacher contact at the high school tomorrow morning in front of the school at 11:15 for an 11:30 teacher-conference-meeting. Classes start next Monday so I’ll get a head start in getting to know the school, its teachers and students before orientation starts on September 6th. I am so incredibly lucky. 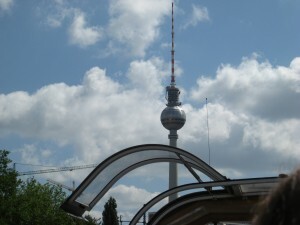 I leave you with this picture I took of the TV Tower last summer, which was the last time I was here in Berlin. The weather is a bit humid (which is killing me since Tacoma has practically no humidity) and wet. Muggy is the best adjective to describe the weather here. But no worries: I am completely at home with rain. Just not humidity. This entry was posted in Jill Nguyen '10, Fulbright to Germany and tagged Arrival, Luck, School, WG-Living. Bookmark the permalink.